Law firms are going through a phase of intense transformation. The way law practices are run has changed more in the last two decades than in the entire century before. One such change is that law firms largely have become corporate entities, and consequently are being run as such. Other changes are the result of the Internet and the emergence of new technologies. This has led to virtual practices, paperless offices, Artificial Intelligence assistants and even some robot lawyers. We work with digital devices, and we need to be aware of cybersecurity. On these devices, files and information are digitized, and as a result, evidence often is digital evidence, which in turn led to eDiscovery. Lawyers and clients find each other online, and interact through social media. Because of the cloud, traditional employment relationships are also disappearing. Most young people opt for self-employment and prefer to take assignments that can be performed at home. The need for a fixed workplace and fixed working hours seem to be obsolete. These changes raise the question of what the future will hold for law practices. Will robots take the place of lawyers? 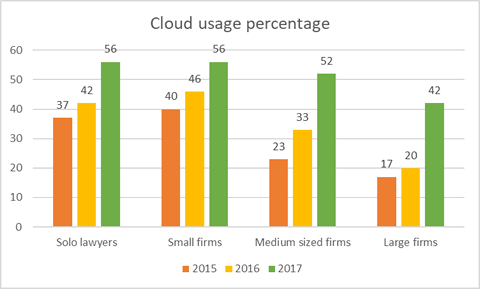 Will offices disappear as everything moves to the cloud? How will the way lawyers work change? We will be looking at the law practice of the future in a two-part series, which is largely based on the Law 2023 Study (www.law2023.org). This study projected what a law firm will look like in 2023. For these two articles that information has been updated and complemented by more recent findings. We will focus on the first three evolutions in the first part of this article, and the other four in the second part. We are, in fact, already witnessing this with, e.g., the arrival of legal chat bots that offer legal assistance (often for free) with regard to parking tickets, damage to luggage claims, applying for refugee status, and even on divorce. A recent study found that approximately 23 % of the work lawyers do at present can be automated. Eager to seize that opportunity, there are dozens of startups that want to offer AI-driven services that offer very specific legal solutions. It is perfectly possible that law firms will start integrating these new technologies in their offer. They would be wise to do so, as it will reduce their costs. And they may even start developing their own such tools (cf. evolution #6). But the main effect of these new technologies is that lawyers will have to start focusing on what brings real value to their clients. Often this will mean specializing in specific fields of expertise. Another effect of these new technologies is that they will lead to entirely new forms of practice, like computer-assisted law, that can only be pursued in this technological environment. Globalization creates a demand for global legal services, which creates new challenges and new opportunities. Proactive firms will develop methodologies and employ technologies to compare and assess how legal issues related to products or services are solved in different jurisdictions. Smart firms already understand how important the element of trust is to their long-term viability. This in turn creates a new market for lawyers who can help other institutions achieve transparency, accountability and responsiveness, by crafting the necessary policies and practices. The demand for greater transparency and responsiveness will not only come from clients but also from the people who will work for the law firm: millennials prefer to work in companies that inspire, and that display a commitment to philanthropy and social responsibility. This ties in with evolution #4, which describes how law firms will tap in to new sources of talent. That will be one of the items discussed in part 2 of the article: The Law Practice of the Future – part 2.